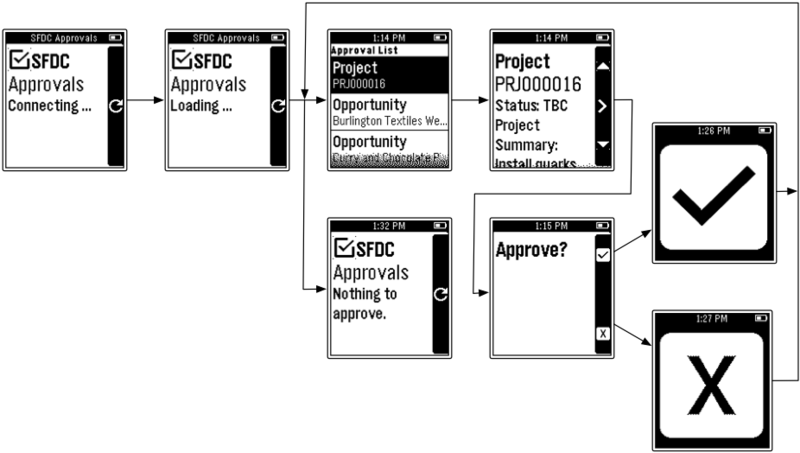 In Part 1, we looked at creating the Salesforce server application to expose the Approvals and the target objects via some REST based web services. 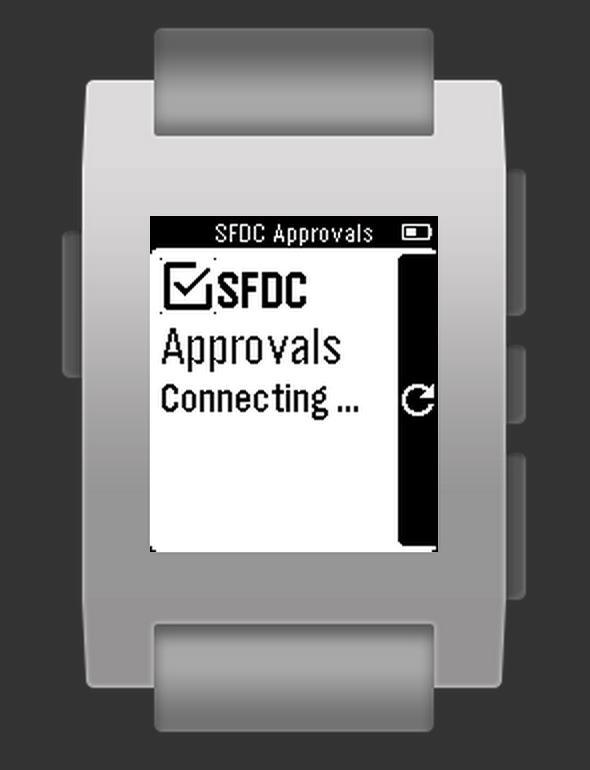 In the second part of this article we look at creating the Pebble watch app and hooking it up the web services. The first thing we need to do is create a connected application in Salesforce. Setup->Create->Apps->Connected Apps and create a new App. Give it an App Name, API Name and Contact Email. Check the Enable OAuth Settings and enter a Callback URL of sfdc://success and finally make sure Access and manage your data (api) is in the Selected OAuth Scopes. Since you will be connecting via your mobile phone you should also set IP Relaxation to Relax IP restrictions. You’re going to need 2 pieces of information from the Connected App, the Consumer Key and Consumer Secret. For now just remember where to find them as you’ll need them later. Click the Add New button next to the Project Resources and upload them. Next we’ll need to configure the Project a little. Click on the Settings menu. Make sure the App Kind is set to Watchapp, the Menu Image is checkbox28x28.png and the Configurable checkbox is checked. 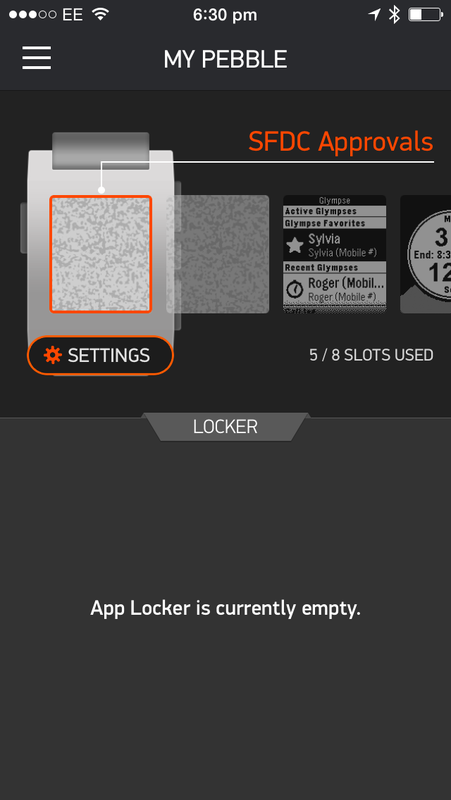 The user clicks the gear icon in the companion app and is presented with a configuration page. The configuration page is an html page hosted on your own web server. For this exercise I’ve hosted the html page in the public folder of my dropbox account and used the public URL to access it. The configuration page prompts for a username and password and passes it back to a local address as a JSON string. There’s some code in there to handle the call back address for the emulator as well as the companion app. We’ll see how we hook this up when we get onto the watch code. * (c) Tony Scott. Licensed under a Creative Commons Attribution 3.0 Unported License. * This software is provided as is, at your own risk and without warranty of any kind. * Please visit my blog: https://meltedwires.com/ and 'like' if you've found this useful. // Build the card body from the fields returned. You’ll see near the top we have a couple of calls to add event listeners for the Configuration screen. These are used to marshall the username and password to the app storage. The login to Salesforce is done using a grant_type of password and therefore bypasses the OAuth flow. This isn’t ideal but we can’t supply a call-back URL to the OAuth flow and even if we could we’d have to make the user login via the config screen whenever the session expires. Once the login is complete we store the token to use for subsequent API requests for retrieving the Work Items to Approve and Approving/Rejecting the Work Items. The Pebble windowing system is very simple and takes a stack approach. When a window is loaded it pushes the window onto a stack. Clicking the back button removes the current window from the stack and the previous window is shown as does hiding it via the application code. I’ll make the Server code available soon or you can cut and paste the code from Part 1. I’m considering moving the Client Id and Client Secret to the Configuration Screen at some point so that I can publish the App and make it freely available on the Pebble App store. Watch this space, I hope you’ve found this useful.